It is difficult to maintain motivation when there doesn’t appear to be any incentive along the journey. When we review our goals, we usually focus on things that are incomplete. We look at what is missing and spend little time looking at what has been accomplished. As with anything in life, we can choose to focus on what is missing and incomplete or we can focus on what is here and complete. Remember that what we focus on tends to multiply. Remember that when we express gratitude for our accomplishments, we are more likely to see those accomplishments multiply than if we simply ask God to grant us what is missing. 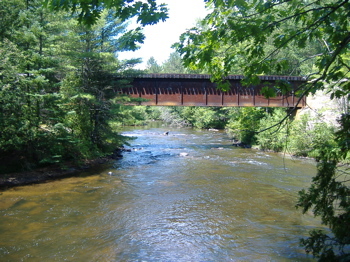 Train bridge over the Peshtigo river in Marinette County, Wisconsin. This is true because it is the way that God works. There are several philosophical and theological explanations for this phenomenon. Bob’s post Glorious at every,every minute got me thinking about God’s glory. From a Christian perspective, and probably several other monotheistic belief systems, God aims to be glorified. Praise and gratitude expressed to God will be returned with more of the focus of the praise and gratitude in order to receive more praise and gratitude. This phenomenon is also referred to as the Law of Attraction or Intention Manifestation. The idea of receiving more of what we express gratitude for also works because it is the way we work. When we live in gratitude for our accomplishments, we are inspired and motivated to continue accomplishing. When we show gratitude along the way to those who help us, rather than waiting for a satisfactory completion, those people will be inspired and motivated to continue. You can express gratitude and appreciation through celebration, recreation, prayer, service and gifts for yourself and those who help you. Take time to appreciate the tasks that have been completed. This is more easily accomplished when splitting the project into small tasks as suggested in yesterday’s post: Breaking Tasks Down for Motivation. This post is part 5 of a series: Motivation to Complete Your Goals. I’m glad to be included in this conversation. I am trying very hard to adopt an “attitude of gratitude” and to spend more energy being thankful and feeling blessed than I do feeling stressed and complaining. I had a bad day on Monday, which reverberated in further complications today. This got me down twice in my week, but I am happy to say that I feel like on the whole I’ve spent more time being positive. It does take come effort sometimes, but I do believe that in the end it pays off. @Bob, you’re welcome. Your post helped me understand the force behind the Law of Attraction from a Christian perspective. Thanks for the great comment. I can relate entirely. Wednesday was my bad day this week. I hit some difficult obstacles and was feeling like I wanted to walk away from my business. My wife listened while I blew off some steam and then I wrote this post which was just what I needed to hear, too. It’s funny how that works sometimes. I agree that writing about what’s going on is a great way to shift our perspective. I also agree with you about gratitude. It’s liberating and empowering. I like your site and will keep coming back. Thanks.